Ohio Congresswoman Marcy Kaptur visited the tobacco fields of North Carolina. What she saw there should concern all Americans. All Americans should ask themselves as they eat strawberries, bananas and apples, order chicken nuggets or smoke cigarettes—whose hands worked to process the crops and livestock that lay at the basis of the best fed and indulged nation in the world? Where do the agricultural workers live, and under what conditions do they labor? The picture for those workers is not pretty. On July 26 and 27, 2014, I toured and witnessed unjust human suffering hidden amongst the tobacco fields of eastern North Carolina, I traveled with Baldemar Velàsquez, who has dedicated his entire life to exposing and bettering the subservient conditions of America’s farm workers. Mr. Velàsquez’s efforts began thirty-five years ago, when, as a young Mexican-American, he organized a union among farm workers of Northwest Ohio’s tomato fields, who toiled under deplorable conditions. The target then was Campbell’s Soup, which had refused to engage the Ohio farm workers in dialogue and even employed strikebreakers. It took nearly a decade of activity, but Velàsquez’ Farm Labor Organizing Committee (FLOC) celebrated victory in 1986 with the signing of a three-year labor contract covering 800 farm workers. He now takes the fight for social justice to R.J. Reynolds and British American Tobacco (BAT, which owns 42 percent of Reynolds). 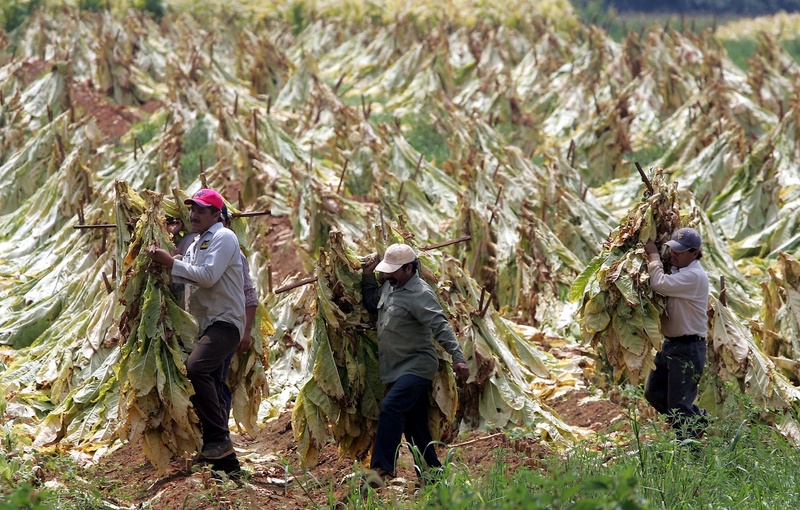 The battlegrounds are North Carolina’s tobacco fields. Mr. Velàsquez and FLOC are appealing to elected officials, religious organizations, community groups and others of good will to pressure Reynolds and BAT to infuse their supply chains with human decency by insisting growers stop the raw practices of labor trafficking, pay workers a decent wage, and provide humane living conditions and basic human rights. Right now, that’s not the case. During my visit, I found workers who labor eleven hours a day under grueling conditions at high season for $7.25 an hour. As many as twelve men sleep jammed inside ramshackle, dilapidated trailers or barracks. There is no hot water, no decent laundry facilities, no air-conditioning, substandard electrical and gas wiring, and flush toilets are a luxury. I saw injured workers, including one man who had lost part of his index finger in a work accident, who lacked basic protections and health care. I heard women testify of the sexual abuse they face to secure work and pay, but still they and their children live in squalor in the richest nation in the world. My counterparts in the British Parliament, Ian Lavery and Jim Sheridan, were also shocked by what they described as human rights violations. Mr. Lavery said rapists and murderers have it better in prison than many of the tobacco workers in Carolina. Both he and Mr. Sheridan broke down in tears more than once at what they witnessed. As my compatriots emphasized, these workers are making only small requests: to establish a guest worker program to end the human trafficking, to end the squalor workers now live in because of poverty wages and to ensure channels of redress without fear of retaliation. We came away with the realization that Americans and the world will not tolerate this level of injustice; they will work to correct it, but these injustices must be brought to light through awareness. The three of us came away from North Carolina with a renewed commitment to social justice, just as people of conscience responded in the 1960s when Cesar Chavez rallied the nation and the world to support the grape workers in California. As Mr. Velàsquez and FLOC stir the conscience of the Americas, we must stand with them to demand social justice on behalf of some of the most unjustly treated people in our society. Marcy KapturMarcy Kaptur, member of the House Committee on Appropriations, has represented Ohio's 9th District since 1983.